Imperfectly Painted: Sinful Colors Mercury Rising....It's too darn hot! Sinful Colors Mercury Rising....It's too darn hot! I don't think words can describe how much I loathe the summer heat. I grew up in Dallas,Texas where it was hot and now I live in Florida where it is not only hot, but it is humid. I don't care how long you've lived in a place that gets hot you just don't ever get used to it! 90 (34c) degree weather with 80% humidity is fair from comfortable. It's always nice to walk outside your house and within minutes you're drenched in sweat... :( You ever get asked would you rather be hot or cold? I always say cold! You can at least layer up if it's cold, but if it's hot taking off layers doesn't help! Anyways, speaking of the heat here is Sinful Colors Mercury Rising! 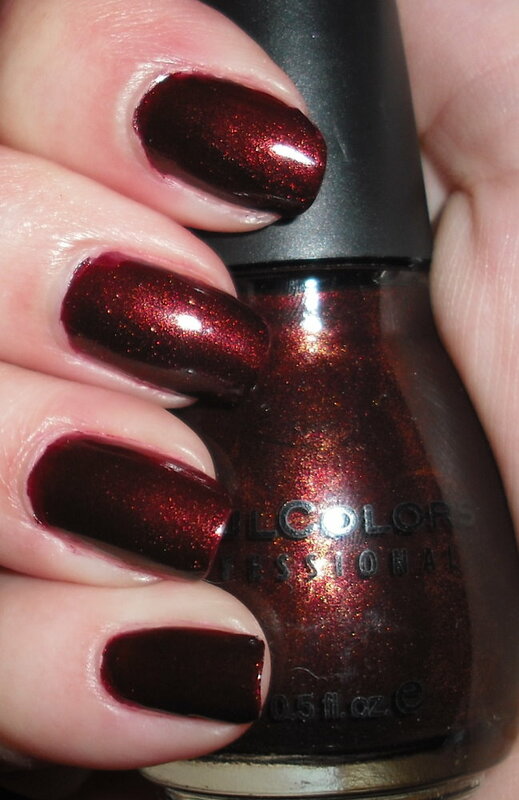 Mercury Rising is a burgundy/maroon shimmer. I used to dismiss colors like this until I was introduced to China Glaze Branding Iron. I absolutely love these red-brown shades now. I've always loved rich deep colors, but never felt like I could pull it off on my nails, but again I was wrong :P. I actually think shades like these are pretty universally flattering. This a great color on your nails, but these are some of my favorite types of colors for my toes in fall and winter. That's all for today. I am going to spend the day in my comfortably cool apartment that is currently blasting the air conditioning. I must admit in the summer I do love air conditioning more than nail polish *hides*! I think I would literally melt with out it. I can't wait until October when it finally gets somewhat cooler here! Maybe I should move to the Southern Hemisphere during my summer months. Would you rather be hot or cold? Why? very pretty! i almost bought this one when walgreens was having their $0.99 deal on them, but i passed. will definitely get it the next time i'm there. And cold, for the same reason as you. Lately it's been crazy hot here also, and humid as well. With some heavy storms in between, and then sun straight after again, making it even more humid!
! this looks really nice on you! blech humidity is sssooo groosss.. I love living in the bay area.. it's cold in the summer.. and sometimes it gets hot..i.e. 70-80 degrees.. Very pretty! I have this but haven't used it yet. I prefer being hot actually. I live in Washington and I get so tired of the cold and the rain. Last summer there was one day where it was 94 degrees and everybody was complaining but I loved it!! I guess I would rather be hot but it's so hot right now that I wish it were cold. i can't stand the heat or cold. it' burning in my area right now. I would much rather be cold. Like you said, you can always layer up. Sleeping and thinking and doing pretty much anything is way harder in the heat, at least for me. Cold, for much the same reasons. We're having a heat wave here and I hate it. I don't even want to think about the utility bill this month. Just that much less for nail polish :). Caitlin- It does look like falling leaves. I hear you I get migraines too that can be triggered by heat. Shiny- That's exactly how the weather is here in summer. It gets really hot and then in the afternoon it storms, but it doesn't cool down it just gets really steamy. Pretty- Bay area? I am SO jealous. I absolutely love N. California. The weather there is perfect for me year round! Enamel Girl- Both are pretty bad. I remember how much I complain when it's cold ,but I'd still pick that any day over hot! Lacquerware- Yes over 70 is AC weather :P.
TropicalChrome- Ugh my utility bill goes through the roof June-Sept...I have to say it's worth it though.